Newton on Trent is a village and civil parish in the West Lindsey district of Lincolnshire, England. The population of the civil parish at the 2011 census was 389. 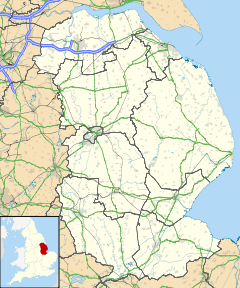 The village is situated east of the River Trent, and approximately 10 miles (16 km) south from Gainsborough, 10 miles (16 km) west from the county town of Lincoln, and at the junction of the A57 running east to west, and the A1133 running north to south. West of the village, between it and the Trent, is the site of a Roman fort. It was discovered in 1962, and probably dates from the Claudian[clarification needed] period. The area enclosed is likely to have been at least 30 acres (0.1 km2). Fortresses of this size are not sufficiently large for a whole Roman legion, but would be adequate for a half-legion. Classified as a vexillation (smaller) fortress, it is an ancient Scheduled monument. The village is listed in the 1086 Domesday Book as "Neutone", with 100 acres (0.4 km2) of meadow. The Grade II* listed church is dedicated to saint Peter and dates from the 12th century with later alterations and an 1876 restoration. The 12th-century tower is of four stages, and there is an early 13th-century west doorway. There are several Grade II listed buildings in the village: White House farm house which dates from the 15th century, Hall Farm House, of painted brick, which dates from 1656, the red brick Old Hall Farmhouse which dates from 1695, and The Reindeer, a 17th-century red-brick public house. Newton on Trent CE Primary School serves the village. Originally built as a Parochial school in 1857, it was restored in 1880. The most significant graves in the churchyard are of the wife and daughter of the Methodist missionary, John Hunt; the daughter's stone records that she was born in Fiji, the family returning to England after Hunt's death. His name is still held in high esteem in Fiji. The Dunham Bridge crosses the River Trent into the village of Dunham in the county of Nottinghamshire. The original toll bridge was built in 1837, had four segmental cast iron arches on ashlar piers and cast iron railings. The bridge superstructure was rebuilt in steel in 1975-76, retaining the original piers; a new toll booth facility was constructed in 1994. ^ "Civil Parish population 2011". Neighbourhood Statistics. Office for National Statistics. Retrieved 25 May 2016. ^ "Newton on Trent". Parish Councils. Lincolnshire County Council. Retrieved 14 July 2011. ^ Historic England. "Newton on Trent Roman Fort (324778)". PastScape. Retrieved 14 July 2011. ^ Historic England. "Roman Fort, Newton on Trent (1003608)". National Heritage List for England. Retrieved 14 July 2011. ^ Newton on Trent in the Domesday Book. Retrieved 14 July 2011. ^ Historic England. "St Peter, Newton on Trent (1064109)". National Heritage List for England. Retrieved 14 July 2011. ^ Historic England. "White House Farmhouse, Newton on Trent (1147202)". National Heritage List for England. Retrieved 14 July 2011. ^ Historic England. "Hall Farm House, Newton on Trent (1147213)". National Heritage List for England. Retrieved 14 July 2011. ^ Historic England. "Old Hall Farmhouse, Newton on Trent (1359489)". National Heritage List for England. Retrieved 14 July 2011. ^ Historic England. "The Reindeer, Newton on Trent (1359469)". National Heritage List for England. Retrieved 14 July 2011. ^ "Newton on Trent CE School". Lincs to the Past. Lincolnshire Archives. Retrieved 14 July 2011. ^ Historic England. "Dunham Bridge, Newton on Trent (324781)". PastScape. Retrieved 14 July 2011. This page was last edited on 8 November 2018, at 13:05 (UTC).